Come pull up a seat, tune your instrument and join in a friendly inclusive old-timey jam. We will play old chestnuts but if you want to lead a tune, you’re welcome to introduce it to the group. 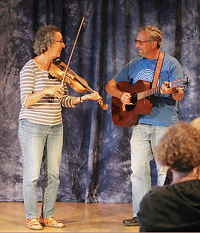 Dinah Stroe has been playing old-timey and Irish fiddle tunes pretty seriously for the past 8 years, coming back after a 30 year hiatus. She and her husband Noah lead an old-timey jam in San Francisco at Andronico’s Market on odd Tuesdays and donate all collections to the SF Food Bank.